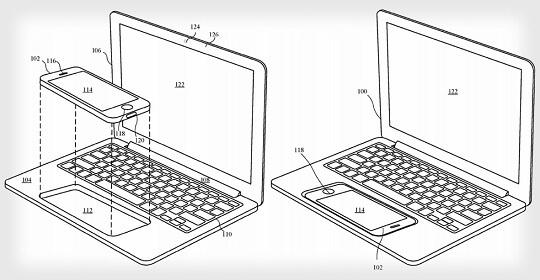 Apple appears to be working on a new crazy idea that allows a portable hardware accessory to transform a smartphone into a laptop. Through a patent application filed in September 2016 and published on March 23, 2017, with the title "Electronic Accessory Device," details of the possible new accessory have been revealed. The proposed hardware would look similar to a MacBook, with the traditional laptop hardware such as a display, physical keyboard, GPU, ports and more, although it won't function without a host. This is when the iPhone comes in. It will work as the host, filling the role of a CPU. The iPhone will act as a "portable computing device" that when inserted into a dock can transform into a laptop computer. Based on the picture shown above, the iPhone would go into the dock space usually provided for a MacBook's touchpad. The iPhone will then take care of the processing and data storage functionalities of the MacBook-looking accessory. Apple's patent also covers the same idea using an iPad. The iPad, however, will be used as the screen instead of a touchpad. There's no guarantee that this thin accessory from Apple will ever see the light of day, but there can be possibilities. If it does, we'll surely have a cool new iPhone and an accessory laptop duo that we can happily carry around with us.